There are many ways to gain exposure for a decentralized cryptocurrency project. A common method that has proven solid time and time again is being listed on a major cryptocurrency exchange. Any cryptocurrency project would mark the addition of their token to a top-flight cryptocurrency exchange as a milestone due to the increased exposure and liquidity that a major cryptocurrency exchange can provide. Recently, this is evident with the addition of 0x to Coinbase, which caused the cryptocurrency to surge by over 40%. The addition of Ravencoin to Binance similarly caused a surge — this time to over 300% against Bitcoin. Decred is the latest project that has enjoyed the benefit of a price increase on the recent announcement of being added to Binance. Decred has enjoyed a 35% price surge over the past 24 hours of trading after the announcement that it will be listed on the world’s leading cryptocurrency exchange by volume, Binance. As stated on the Binance website, trading for Decred pairings against BNB and BTC will commence 4:00 AM UTC on October 24, 2018. The announcement of the news proved to be powerful enough for investors as the bulls raced to buy up the market on other exchanges. The chart above shows how quickly the bulls reacted to the news. Minutes after the announcement, price action began to surge and broke above the elusive psychological $50 resistance handle in a matter of hours. It is common to see price action become so parabolic upon a major announcement such as the addition to a large exchange. This has been evident recently when Binance added a relatively unknown cryptocurrency called Ravencoin, causing a price increase of over 300% against BTC. Trading is not yet active for Decred pairings on Binance but users can make deposits to be ready for when the market is live. It is common to see markets pull back after such parabolic moves. It will be likely that after the addition, the market may pull back slightly as previous users decide to cash in on profits. Being listed on Binance will vastly increase the exposure of Decred to a larger audience. The cryptocurrency will also benefit greatly from the increased liquidity within the market as trading for Decred has been limited to a small number of medium volume exchanges. The increased liquidity will allow more traders to quickly buy and sell Decred without causing as big of an impact on price. 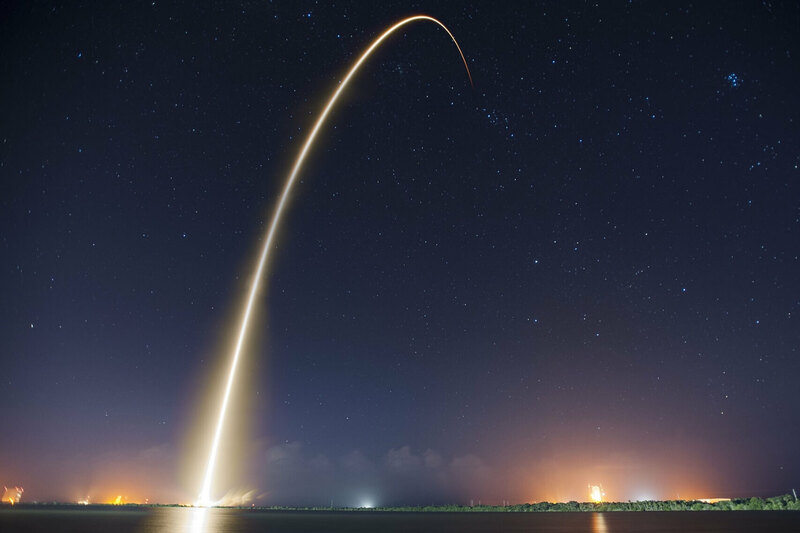 Overall, the addition to a large exchange such as Binance will mark a major turning point in the sentiment for Decred as investors will likely begin to feel more confident about the project’s future. Let us continue to analyze price action for Decred over the short and medium term and evaluate how the market has been behaving. Looking at DCR/USD over the previous 4 months, we can see that the downtrend had met support at a downside 1.414 Fibonacci Extension level (drawn in blue) priced at $33.71 during August 2018. This support proved to be significant as it sustained the market above this level during both September and October 2018. DCR/USD had been trading sideways for the past 10 weeks, until the Binance listing announcement was made. 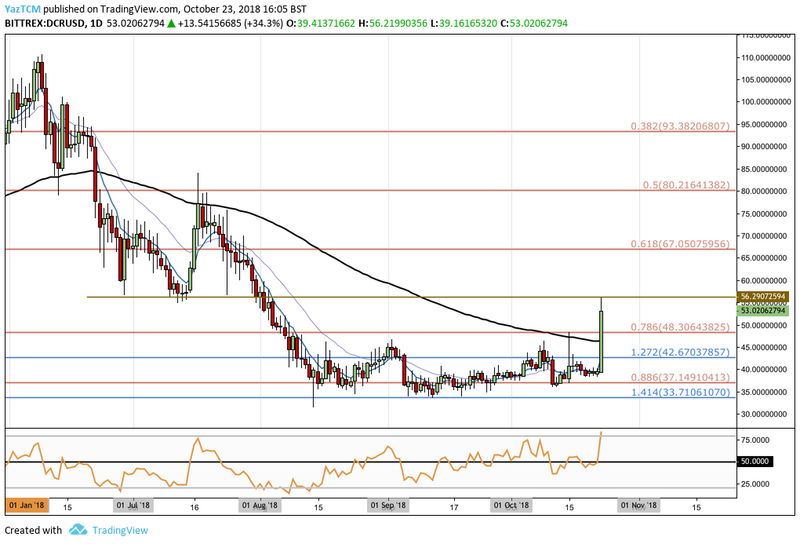 We can see DCR/USD surging all the way above the 100-day moving average until meeting resistance at the $56.29 handle. This price level had provided significant support for the market during July 2018, and is now expected to provide significant resistance for the market moving forward. If the bullish momentum continues as the trading becomes active for Decred on Binance, we can expect immediate long-term resistance above to be located at the previous long-term .618 Fibonacci Retracement level priced at $67.05, followed by the .5 Fibonacci Retracement level priced at $80.21. Let us continue to analyze price action a little closer and highlight any potential short-term support and resistance levels to watch out for. 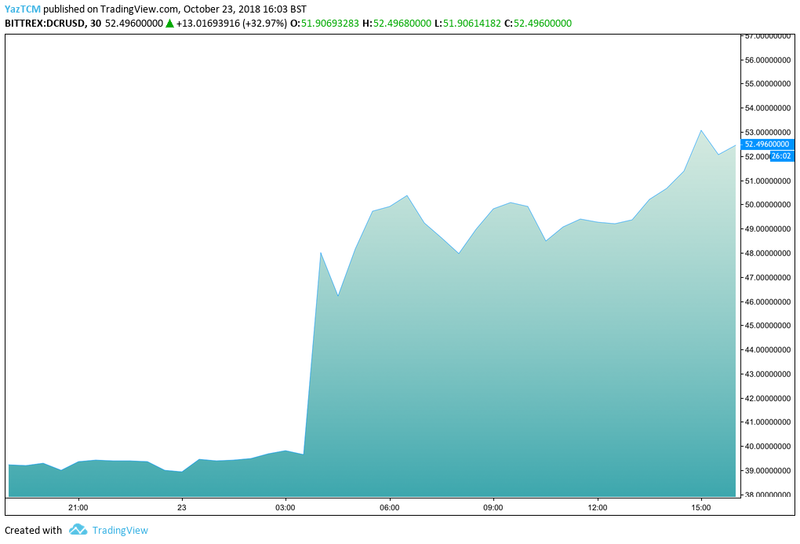 Analysing the market from the hourly perspective above, we can see how aggressively price action surged after the Binance announcement. The market continued to surge until reaching the aforementioned resistance at the $56.29 handle. It is important to highlight that this level of resistance was further bolstered by a short-term 1.272 Fibonacci Extension level priced at $56.05. We can see that as DCR/USD began to pull back from the resistance at $56.29, it found support at the short-term .236 Fibonacci Retracement level priced at $51.95. This Fibonacci Retracement is measured from the low of $38.88 before the announcement, to the high seen at $56.29. 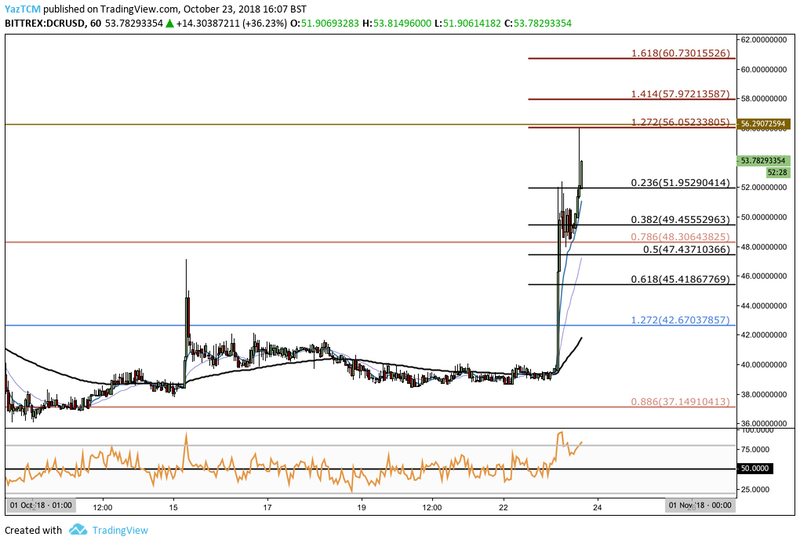 Moving forward, if the bearish pressure enters the market before the trading activation on Binance and pushes price action below $51.95, we can expect immediate support at the .382 Fibonacci Retracement level priced at $49.45. Further support below this can then be expected at the long-term .786 Fibonacci Retracement (drawn in peach) priced at $48.30. If the bearish pressure persists lower, more support beneath can be located at the short-term .618 Fibonacci Retracement level priced at a $45.41, followed by the previous downside 1.272 Fibonacci Extension level (drawn in blue) priced at $42.67. On the other hand, if the bullish momentum persists and pushes the market above resistance at $56.29, we can expect immediate resistance higher to be located at the short-term 1.414 and 1.618 Fibonacci Extension levels, priced at $57.97 and $60.73 respectively. Moving further forward, the bulls are most likely to break above the resistance at $60 soon due to the increased momentum as the Decred markets open on Binance. If the bulls do break above $60, we would look towards the long-term resistance levels for further levels of resistance.